Hello and welcome once again to the ever-popular eG Cook-Off Series. So far this year, we've showcased such divergent dishes as the popular diner classic Hash and the intricate details of Cured, Brined, Smoked and Salted Fish. This summer we argued about the sanctity of the National sandwich of Vietnam-the Banh Mi. (Click here http://forums.egulle...-cooking-forum/ for the complete eG Cook-Off index). Today we start a new adventure--a discussion of Gels, Jell-O and Aspic--a subject with unlimited possibilities for the cook. Gels are at once very traditional, yet at the same time a defining aspect of modernist cooking. Molded Jell-O salads and Tomato Aspic are cherished dishes whose roots reach back over 100 years. But gels aren't simply a jiggly dish found wiggling on a cafeteria line. Joel Robuchon's haute version of "Citron Gelee with Lemon Sorbet and Fraises des Bois," is a contemporary play on the gel theme. Science and technology have entered into gel cokkery in the 21st century. "Mussels in their Juice," (a dish crafted by the renowned Spanish Chef Ferran Adria), is an example of how today's Chefs employ highly sophisticated, scientific techniques to fascinate diners with whimsical dishes literally bursting with flavor. 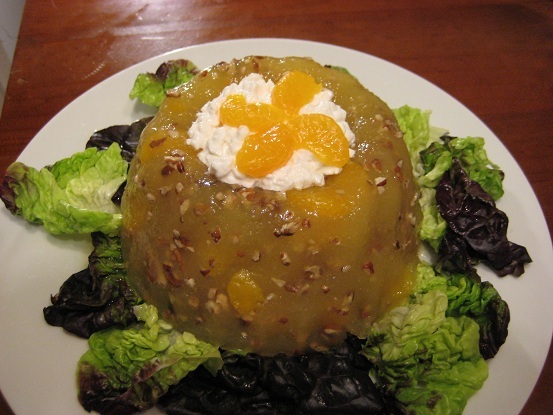 I'm thinking of doing a contemporary version of my Grandmother Edna Pink's Tomato Aspic. Family legend tells me that Grandmother Pink served her aspic at luncheons for the Twin Falls Ladies Bridge Club back in the 1930's. Now if I can just find that old copper mold. Dave, care to run off a short list of what this category covers? I'm planning on giving spherification another go (my first effort yielded mostly a muscatel-flavoured glop, I'm pretty sure I can top that). I love gels and I have a variety of gelling agents (e.g. gelatine, konjaku, alginate), so I'll be playing with a variety of them. This is going to be great, and I'm hoping to also see the interesting things people do with eggs and tofu, and as well as the traditional gelled dishes and modernist takes on this. 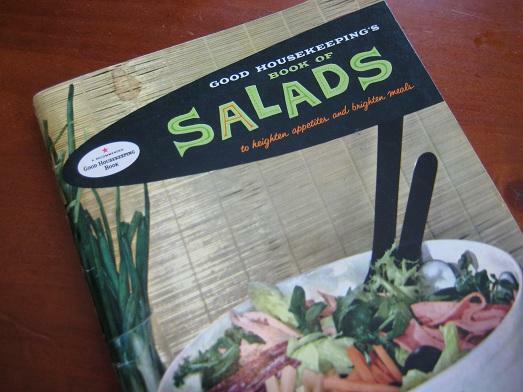 In the traditional category, I think of cold dishes and salads that use Jell-O or unflavored gelatine. While I was researching this Cook-Off, I came across Grandmother Pink's recipe folder-an old black leather booklet holding hundreds of recipes that she had written on small index cards, (in long-hand, cursive writing with an ink fountain pen). She had scads of molded gel salads in her collection. Her salads ran the gamut from basic clear gel salads to sweet, (with fruit and nuts), and savory, (with cold meats). It's the modernist movement that I think will open for me a whole new world of thinking when it comes to gels. From my novice background on the subject, I've learned that the Modernist Cuisine series defines gels as both fluid and firm. That opens this Cook-Off to a lot of possibilities. Eggs can be considered gels, as can other dairy products. Even tofu can be considered a gel. Then we have gels that enclose fluids, like Adria's "Mussels in their Juice," that I mentioned in the opener. It can be a shell composed of hardened gel that encases a liquid of more fluid gel. Gels could be used to form a flat sheet of gel then extruded or cut into noodles. A gel-noodle could be quite intriguing. So we can go retro, vintage or traditional, but then our modern bent may take us into a whole new universe of experimentation. 99 Ranch had packets of unflavored agar agar that were tempting, except for their intensely dyed colors of maraschino red and xmas tree green. Yikes! Be kinda fun to make a layered dessert along the lines of Rachel's rainbow jello mold, but use a different jelling agent every few layers. Such fun to play with the different shattering characteristics as its eaten. 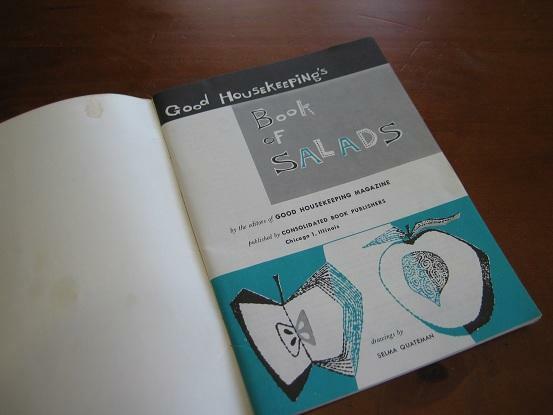 I think my first dish will come out of this 1958 Good Housekeeping classic booklet, the "Book of Salads, to heighten appetites and brighten meals." I am thinking back to a dessert we served often in the 70's made with rennet: This is an example. It was softer and not as clear as a gelatine but really lovey in texture. I love that clip art and the tag line, "Just like Mother used to make." David, would soft gels based on cornstarch fit in here? What about tapioca? Wow! I used to adore that Danish Dessert Junket stuff, reading this I could almost taste it! To me, as a kid who HAD to have whole berry cranberry sauce (thenkyewverymuch)with turkey, even left over T'giving sandwiches, this was PERFECT! But it was a hell of a lot cheaper back then! Definately. Just last week I was making a huckleberry pie and many of the recipes called for quick-cooking tapioca. I couldn't get over the vision of little eyeball gels staring out of a slice of my huckleberry pie. Tapioca is definately a product that turns into gel--and it gels other foods. (Just not in my pies). That sounds really bad. Even if it somehow manages to taste okay, it has to look like something the cat's stomach rejected. You mean you can't get powdered tapioca up there (almidon de yuca)? That solves the whole "wonky eyeballs" thing, and very easily too. For my part, since I now know what's possible with this cook-off, I'm going to experiment with using the less traditional gelling agents together with tropical fruits, in dessert style applications. A medium-set tapioca mousse of passionfruit and mora-carambola is calling! Anyone planning on giving a gelatina encapsulada/artistica a go? I'm completely fascinated by these, although I know that it could be argued that they're pure kitsch, but as is the case with many kitsch things, a tremendous amount of painstaking labour is involved in creating them, and I think these could be made interestingly tasty, and really lovely. Anyone tried, or at least eaten one of these? I don't remember seeing "powdered tapioca" in the store, although I think I've seen "tapioca flour" in a package from Bob's Red Mill. As far as pies, the Cook's Illustrated cherry pie recipe calls for taking the pearls and whizzing them in a spice grinder until they turn into powder. That solves the texture issue for my husband, at least. That is beautiful. Gives me a greater appreciation for aspic. 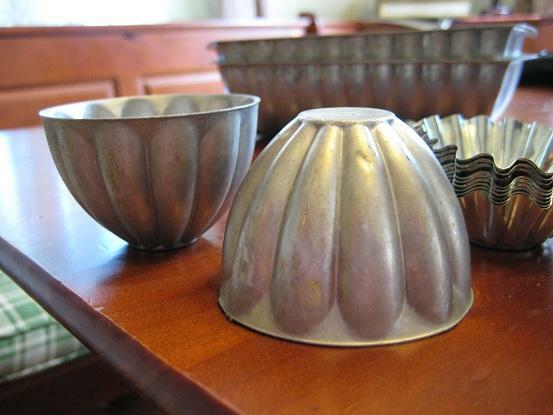 In the background are some various molds I've used over the years for pastries and desserts-just never a molded, gel or Jell-) dish. My first dish for this Cook-Off is a 2012 version of the 1958 classic "Orange-Ginger-Ale Ring" taken from the Good Housekeeping Booklet. Grandmother Pink also had a recipe card for a gelled ginger ale salad which speaks to the popularity of this dish that was cheap, easy to make and tasted good. When you think about the combination of flavors and textures, it makes sense in a contemporary kitchen-Sweet orange citrus flavors with the punch of ginger and fizz. If you look at the list of ingredients in this dish, you start to think how you can adapt it for a modern presentation. 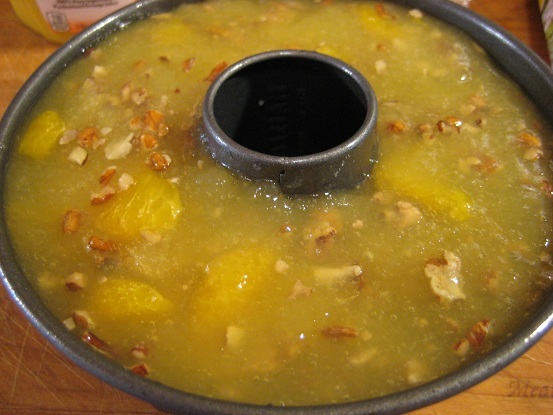 The recipe is very basic-soften the gelatine in the lemon juice. 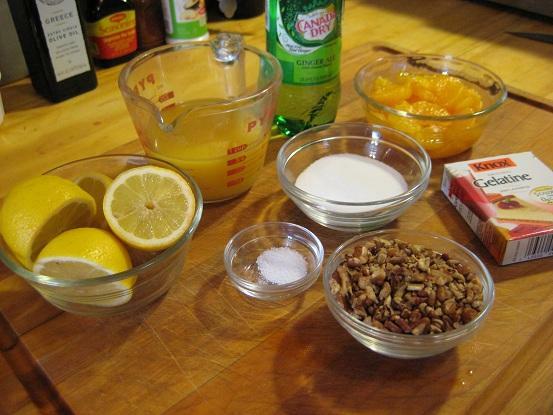 Combine the sugar, salt, orange juice, ginger ale, orange sections and pecans in a saucepan. Heat until hot but not boiling, then add the softened gelatine. Combine this mixture in a ring mold. 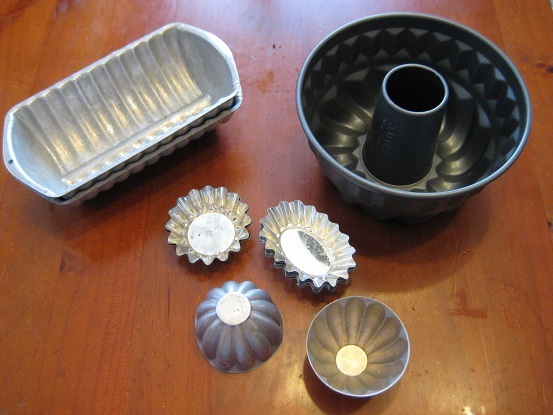 (I used a non-stick bundt cake ring mold). Chill the salad for about 2 hours until fully set then unmold and garnish with cottage cheese, orange slices and "crisp greens." (I used baby butter lettuce). I doubled the gelatine to 4 envelopes because I found the ratio of liquid to gelatine called for in the recipe didn't allow the mixture to gel. I also cut the 2 cups of orange sections by half to 1 cup. Now before you start to wince when you view these photos, let me say that this salad was delicious. You could really taste the flavors of the ginger ale. Surprisingly, you could also taste the carbonation of the ginger ale. I had anticipated that the fizz from the soft drink would fade when it was heated then chilled with the gelatine, but it retained a lot of that classic flavor. I don't know why we shy away from buying little tubs of cottage cheese when we're in the supermarket. It's delicious and we should use it more in recipes. 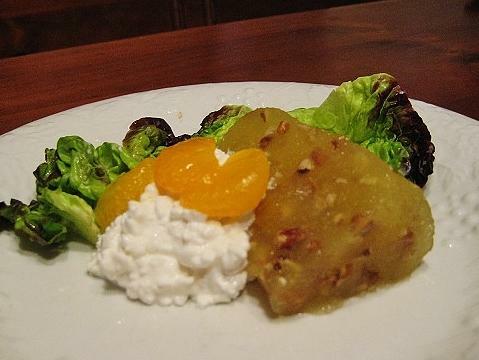 A few years ago I came across a recipe from famed French Chef Andre Soltner that called for substituting fresh Farmer's cheese with pureed cottage cheese. Imagine the fresh, mild flavor of cottage cheese in a silken form, (not the texture of small cheese curds). Maybe a layer of cottage cheese puree topped by a layer of orange-ginger ale gel encasing a poached chicken supreme? We'd love to hear more about this dish and the techniques. This was my first attempt, but that sounds like a good idea. Right now I'm looking at a tin of coconut milk, a pomegranate, some orange flower water and an arry of gelling agets, trying to figure out how to make this all come together. I'm wondering whether the fat in the coconut milk might interfere with gelling, but then again, that doesn't seem to be an issue with panna cotta, so optimistic. 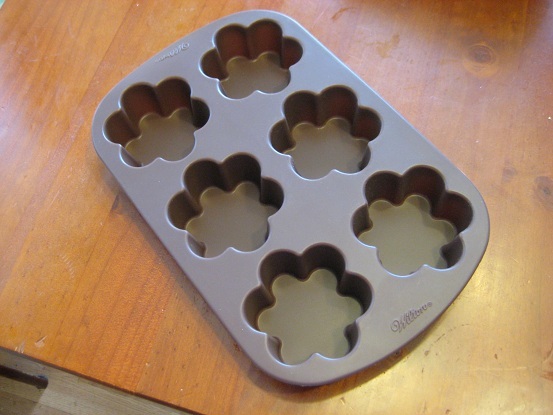 Dave, I really love your selection of decorative moulds, wish I had something like those, but mine is probably going to be a big white blob. Canadian Thanksgiving is coming up and my Thanksgiving table is not complete without a tomato aspic with cocktail shrimp, hard boiled eggs, celery and green peppers. It was always part of Thanksgiving dinner ( and Christmas too ) as a kid. No one liked it but my mother and myself ( my sister is allergic to shrimp but it still went on the table ) and now no one likes it at my home but myself but I still put it out there. I have never found a recipe that seems to contain all the same stuff that my mother put in. Pure nostalgia in a metal bowl. No fancy molds here. The Thanksgiving plate just isn't the same if I'm not mopping up the melted aspic with some mashed potatos at the end.